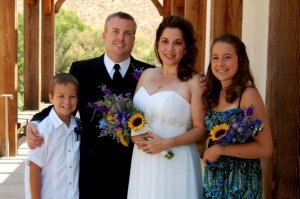 The family history of Jeff Greene and Colleen (Robledo) Greene. A promising stop on our family history adventure! My 39th entry in Amy Johnson Crow’s “52 Ancestors in 52 Weeks family history blogging challenge. The challenge: have one blog post each week devoted to a specific ancestor. It could be a story, a biography, a photograph, an outline of a research problem — anything that focuses on one ancestor. My 39th ancestor is my husband’s 3rd great grandfather, Miles Washington Harless (1826-1891). Miles was the father of Leonard Jackson Harless (1858-1946), who I discussed in my last blog post. Miles, his wife Margaret Gann (1830-1919), and newborn son Leonard Jackson emigrated from Missouri to California, crossing over the Sierra Nevada range via Ebbetts Pass in the summer of 1858. Miles also provides our family’s roundabout connection to the famous Hatfields and McCoys. 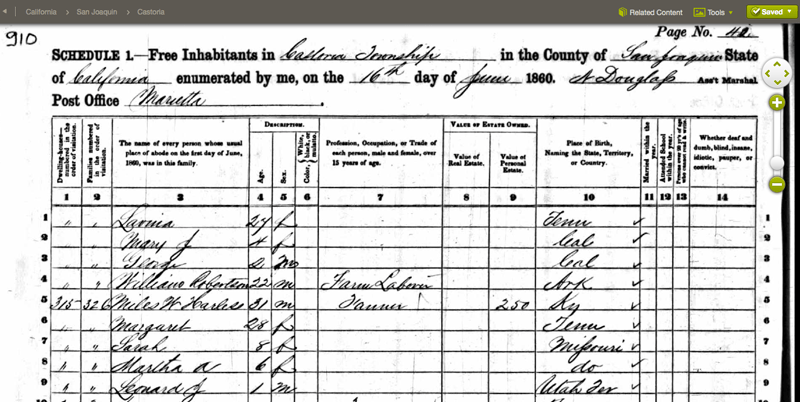 1860 US Census, Castoria Township, San Joaquin County, California. The Miles Washington Harless household. Courtesy of Ancestry.com. Click to view larger image. The 1860 U.S. Census is the first federal census that records the family living in California (16 June 1860), roughly two years after following the old emigrant route through Ebbetts Pass. The Harless household resided in Castoria Township (San Joaquin County) at this time, served by the Marietta Post Office. I plotted notes on a custom genealogy road trip Google Map before setting off on this trip. But, failed to print the map ahead of time and was afraid of what sort of data signal we might encounter that day. So I took a bunch of screenshots of the day’s maps. A little bit of research taught me that Castoria was another name for French Camp, an unincorporated area that once served as the southernmost regular camp site for the Hudson Bay Company, who traded furs from Fort Vancouver. French Camp is also a California registered landmark. Awesome! Sounds like a cool place with which to have an ancestral connection and to visit! After all, French Camp is just 82.5 miles (1 hour, 40 minutes) from Dorrington, which is where we were camping after crossing Ebbetts Pass. A simple day trip across the San Joaquin Valley. So the day after hiking in the footsteps of these ancestors on a stretch of the Old Emigrant Trail, my husband Jeff and I loaded up the RV and the dog, and set off for historic French Camp (aka Castoria). 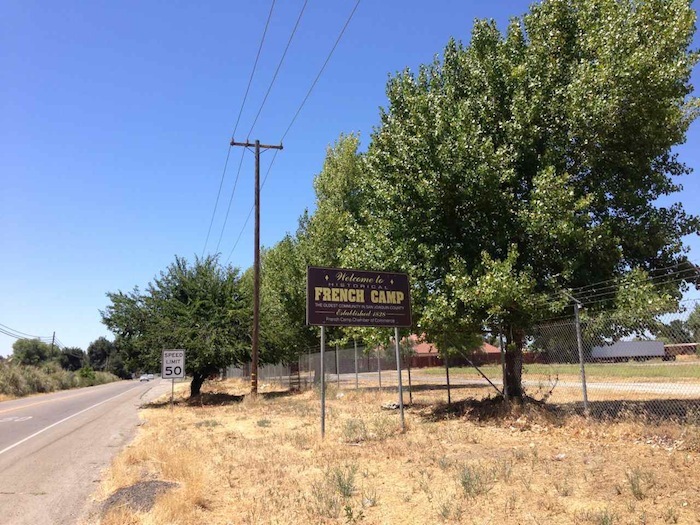 A quick internet search prior had revealed a huge sign put up by the chamber of commerce welcoming visitors “to historical French Camp, the oldest community in San Joaquin County, established 1828”. Such a proud well-advertised claim by a local chamber surely meant that there would be a cute preserved historical district, where we would hopefully be able to find at least one or two structures dating back to 1860 when Miles Washington Harless and his family lived there. And definitely a cute little downtown business area in that historical district, where we could grab a relaxing lunch, sit outside on the patio with our dog, and soak in the surrounding history. I anticipated a little museum, where I could chat with a local historian who might recognize the Harless name and be able to point out the current location of the area noted as their home on that census record. Alright, so the sign, when seen in person, isn’t quite as big as the versions floating around on the internet appear. But, this IS prominently placed on the main highway into town, and it does still boast about the community’s history. Driving into French Valley, we saw that big proud sign from the chamber of commerce. We weren’t sure where to find the historical district, so we just kept driving. And driving. And driving. In circles. Taking a bunch of different roads through town, and around town. Looking for signs to the historic district. Signs that did not exist. Because no cute little historic district exists. The town looked like any small community that has seen better days. We found one or two old homes, and the California landmark plaque at the school, but nothing else that would ever make someone who hadn’t seen that big fancy chamber sign think this was a town of any sort of historical significance. Driving the main highway around town. The livestock auction yard post-dates our ancestors’ time in French Camp, but I imagine that there was some sort of similar setup around back in 1860. We drove around town, looking for old buildings that might date back to 1860. This home looks sort of old. Maybe? Now we’re talking! Jeff and I chose to pretend that this might have been the 1860 Harless home. The school is one of the few older looking building, but no where near as old as we were hoping. The elusive historical landmark plaque is located in the school parking lot. And lunch? We spotted two fast food type places. That was it. Lunch would happen somewhere else. French Camp was a huge disappointment, on so many levels. I really should have investigated more before our vacation, sparing us the 4 hour round-trip drive across the entire San Joaquin Valley for nothing. It did however, provide us a glimpse of where our Harless ancestors lived after crossing over Ebbetts pass (and most likely taking their same route, along what is now Highway 4). So even Jeff admitted the trip was not a total waste. Fortunately, my husband loves to drive, loves road trips, loves country roads full of a lot of nothing, and can find humor in any situation. I have no doubt my husband knows very well that he will spend many more years going on genealogy wild goose chases with me. The trip wasn’t a total loss. My husband got to check another Bass Pro location off his bucket list, since Manteca was so close. 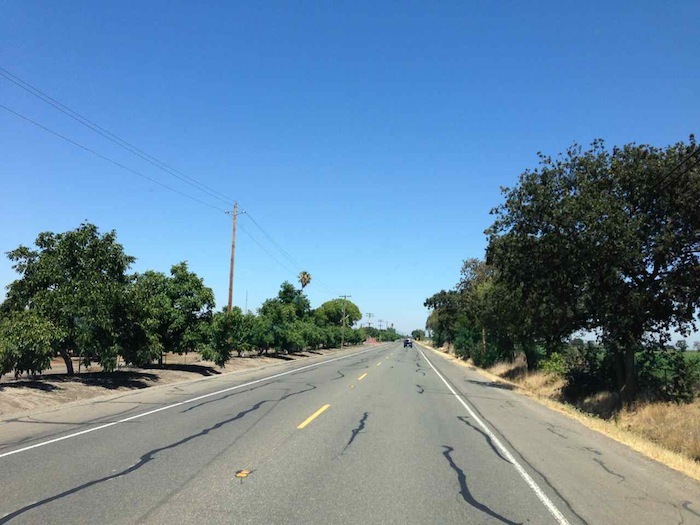 Jeff didn’t consider this road trip across the San Joaquin Valley a total loss. Bass Pro Manteca…the only Bass Pro we have encountered that does not allow dogs. When we headed to Maricopa for the third and final leg of our Sierras genealogy camping trip, I smartly decided to stop at the local history museum first before doing any exploring out that way. What a well done museum! Staffed with helpful, friendly volunteers who are very knowledgeable about the area. When I mentioned to one of them that we recently drove across the valley from the mountains to visit our ancestral home in French Camp, the docent started laughing and asked me how we liked French Camp, and what we found there. Yeah… we all got a good laugh out of that. Highway 4 heading out of town. On to our next Harless stop. A lot of corn growing alongside this part of Highway 4. Since our Harless folks were farmers and raised livestock, I imagine this area still looks pretty similar to what they saw here in 1860. Picture this view minus the asphalt and utility wires, and Highway 4 probably looks like it did back in our Harless days. I have lived in French Camp almost a year. There are actually quite a few beautiful Victorians he could have lived in. Some of them are tucked away and some have been defaced to a ugly stucco exterior which makes it hard to date. This one is a google map picture and is my favorite. French Camp has always been an agricultural community and so the only downtown to speak of has always been on French Camp road near the Post Office, Firehouse, Elementary School and further up Beattie’s market as well as the old Japanese Community Hall. Stockton has incorporated much of the farm land (Western Ranch) north of the Hospital and so things are starting to change. The Chinese cemetery is also very interesting, as it goes back to a time when Asians were not allowed to be even buried in the same place as Caucasians. Receive updates delivered to your inbox! Your email address will not be shared.